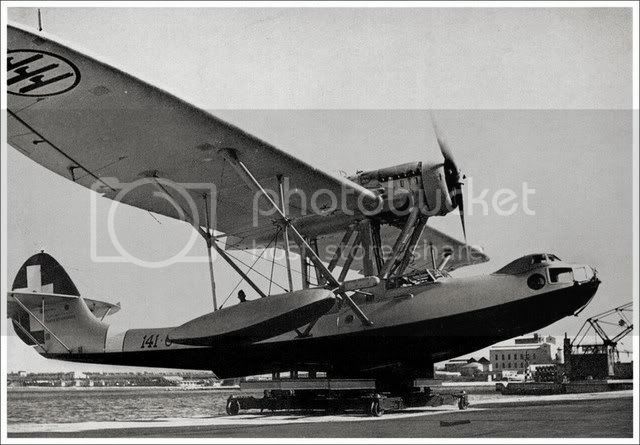 Following the end of the Great War, Dornier moved to Italy and became a subsiduary of Caproni. Their "Wal" design proved to be a large commercial success and the Regia Aeronautica purchased a few examples. 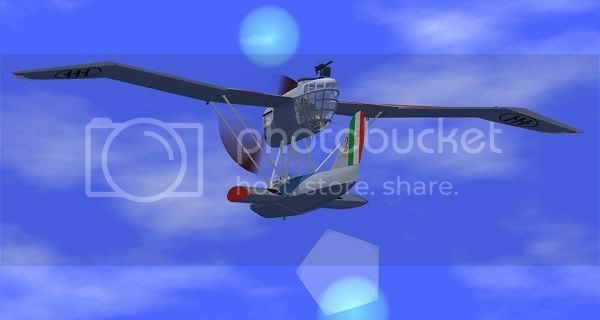 An extremely small flying boat that built on Macchi's success with previous aircraft. Served as the standard fleet reconnaisance aircraft from shipboard catapults throughout the 1920s. 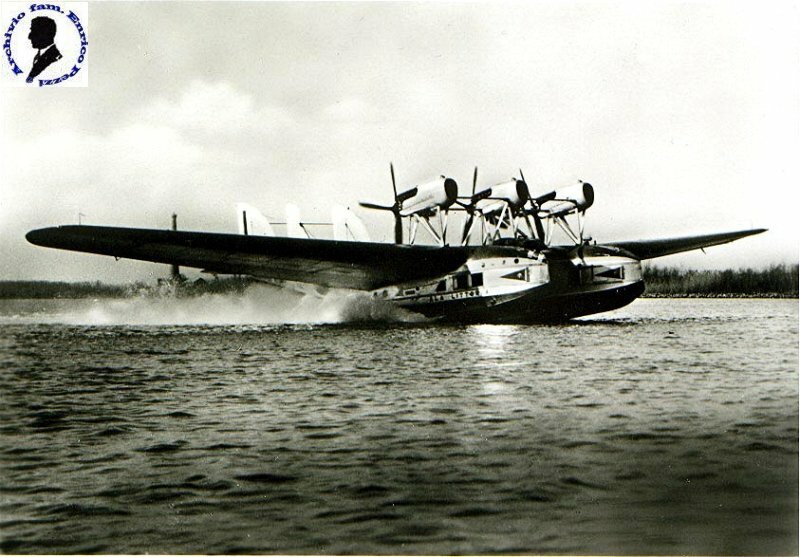 A larger version of the S.55 flying boat retaining the same overall configuration. 12 currently serve as transport aircraft. 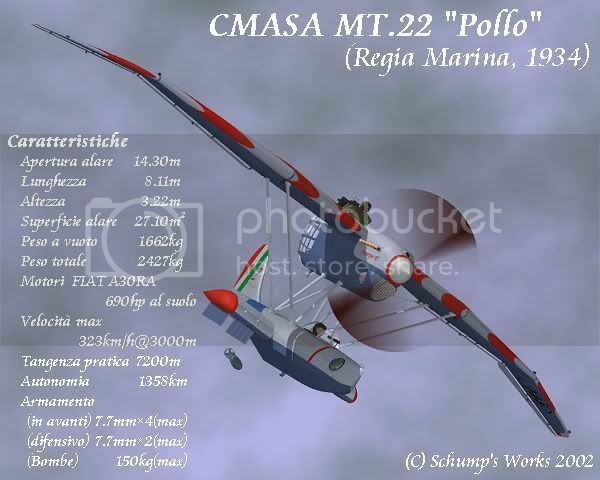 The winner of the 1931 competition to find a replacement for the M.18, the Pollo is an elegant aircraft with distinctive gull wings and no tailplane. The observer has an excellent field of view. Entering service in 1932, the engine was found to be slgihtly tempermental at first but this was rectified in 1933. On the whole a well regarded aircraft. The Z.501 was the first design of Ing. 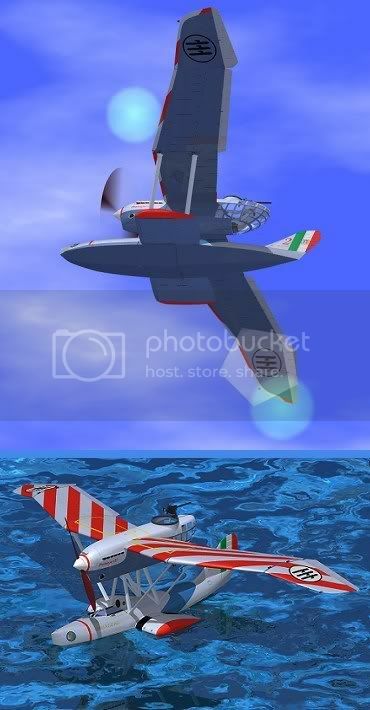 Zappata following his return to Italy. Quite a small flying boat although it seems to exude size. The Regia Aeronautica bought 90 examples which operate from land bases in the Meditterenean and the Red Sea. Designed as a bomber and naval reconnaissance plane to supplement the Z.501, the Z.506 has a much larger range. Wood and fabric construction with metal floats. A deep fuselage houses an internal bay for a single 450mm torpedo. Armament comprises of a single13.2mm Scotti in a Breda electrically powered turret and a single 7.7mm Gebauer 34M in the ventral position. Operations with the CD-1 had been moderately successful in proving the viability of a relatively large autogyro capable of carrying a useful load. As a result, the Cierva company designed the larger R1 which was able to take two passengers and a number of depth bombs. Italy purchased a number during the late 1930s which were fitted with Alfa-Romeo 128 engines and a forward firing 13.2mm machine gun. The type was mostly used for reconnaissance and anti-submarine duties but found a useful role in transferring medical emergencies.